Running the Numbers – How Can Hamilton Still Take the 2016 F1 Drivers’ Championship? 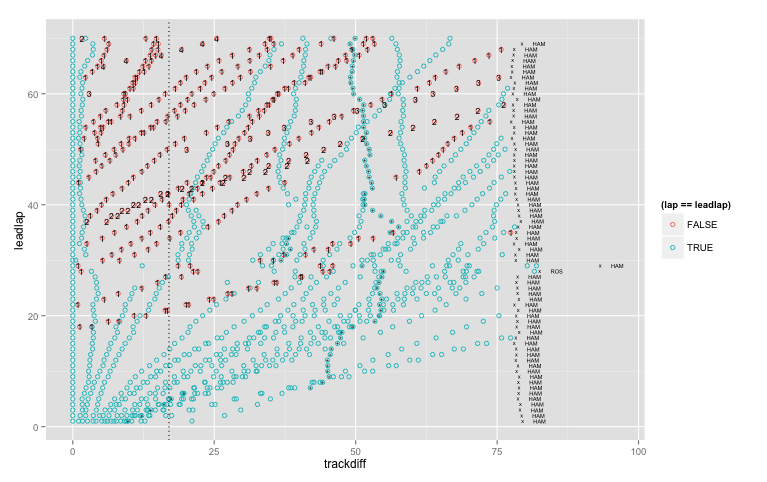 Way back in 2012, I posted a simple R script for trying to work out the finishing combinations in the last two races of that year’s F1 season for Fernando Alonso and Sebastien Vettel to explore the circumstances under which Alonso could take the championship (Paths to the F1 2012 Championship Based on How They Might Finish in the US Grand Prix); I also put together a simple shiny version of the script to make it bit more app like (Interactive Scenarios With Shiny – The Race to the F1 2012 Drivers’ Championship), which I also updated for the 2014 season (F1 Championship Race, 2014 – Winning Combinations…). Author Tony HirstPosted on October 31, 2016 Categories RstatsTags f1datajunkie1 Comment on Running the Numbers – How Can Hamilton Still Take the 2016 F1 Drivers’ Championship? An undercut is where Driver A leads Driver B, but Driver B turns into the pits before Driver A and changes to new tyres. As Driver A is ahead, he’s unaware that this move is coming until it’s too late to react and he has passed the pit lane entry. On fresh tyres, Driver B then drives a very fast “Out” lap from the pits. Driver A will react to the stop and pit on the next lap, but his “In” lap time will have been set on old tyres, so will be slower. As he emerges from the pit lane after his stop, Driver B is often narrowly ahead of him into the first corner. d2’s position on their outlap (lap X+2) is greater than d1’s position on the same lap X+2. d2’s position on their outlap (lap B, in the inclusive range [lap A+3, lap A+2+N]) is greater than d1’s position on the same lap B. One way of implementing these constraints is to write a declarative style query that specifies the conditions we want the solution to meet, rather than writing a procedural programme to find such an answer. Using the sqldf package, we can use a SQL query to achieve just this result. One way of writing the query is to create two situations, a and b, where situation a corresponds to a lap on which d1 stops, and situation b corresponds to the driver d2’s stop. We then capture the data for each driver in each situation, to give four data states: d1a, d1b, d2a, d2b. These states are then subjected to the conditions specified above (using N=5). With a five lap window we have evidence that supports successful undercuts in several cases, including VET taking KVY and HUL with his early stop at lap 13+1 (KVY pitting on lap 19-1 and HUL on lap 20-1), and MAS and BOT both being taken first by HAM’s stop at lap 18+1 and then by VET’s stop at lap 42+1. To make things easier to read, we may instead define d1a.lap+1 AS d1Pitlap and d2b.lap-1 AS d2Pitlap. The query doesn’t guarantee that the pit stop was responsible for change in order, but it does at least gives us some prompts as to where we might look. If charts are pictures, and every picture not only tells a story, but also saves a thousand words in doing so, how then are we to actually read them? Take the following example, a quick #f1datajunkie sketch show how the Bahrain 2015 qualifying session progressed. The chart is split into three, one for each part of qualifying (which we might refer to as fractional sessions), which already starts to set the scene for the story. The horizontal x-axis is the time in seconds into qualifying at which each laptime is recorded, indexed against the first laptime recorded in qualifying overall. The vertical y-axis records laptimes in in seconds, limited to 107% of the fastest laptime recorded in a particular session. The green colour denotes a driver’s fastest laptime recorded in each fractional session, purple the overall fasted laptime recorded so far in a fractional session (purple trumps green). So again, the chart is starting to paint a picture. 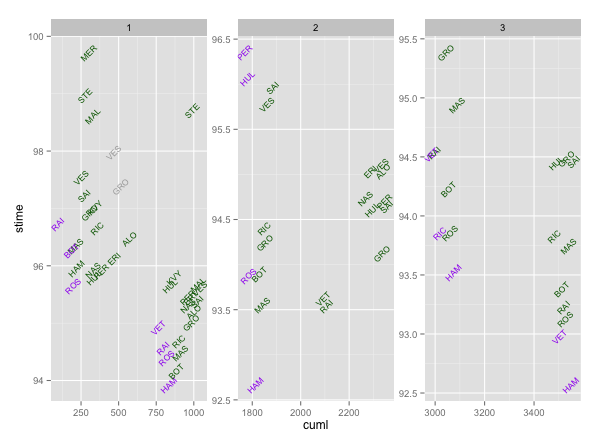 We don’t get the time gap exactly from the chart, but looking to the rightmost panel (Q3), finding the lowest vertical marks for HAM, VET and ROS, and imagining a horizontal line across to the y-axis, we get a feeling for the relative gaps. Q1 got underway in slightly calmer conditions than blustery FP3 and Raikkonen was the first to take to the track, with Bottas joining the fray soon after. The Williams driver quickly took P1 but was then eclipsed by Rosberg, who set a time of 1: 35.657 on the medium tyres. Q1 is the leftmost panel, in which we see RAI setting the first representative laptime at least (within the 107% limit of the session best overall), followed by BOT and then ROS improving on the early purple times. The Mercedes man was soon joined in the top five by soft-tyre runners Nico Hulkenberg and Felipe Nasr. HUL and NAS appear around the 300 cuml (cumulative laptime) mark. We note that PER is there in the mix too, but is not mentioned explicitly in the report. In the closing stages of the session those in the danger zone were Max Verstappen, Pastor Maldonado and Will Stevens and Roberto Merhi. Verstappen found the required pace and scraped into Q2 with a time of 1:35.611. Maldonado, however, failed to make it through, his best lap of 1:35.677 only being good enough for P16. With an evolution of the cutoff time, and a zoom around the final cutoff time, we should be able to see what went on rather more clearly. At the top of the order, Hamilton was quickest, finishing a tenth in front of Bottas. Rosberg was third, though he finished the session close on half a second down on his team-mate. Felipe Massa was fourth for Williams, ahead of Raikkonen, Red Bull’s Daniel Ricciardo and Sebastian Vettel, who completed just three laps in the opening session. All drivers set their best times on the soft tyre. This information can be quite clearly seen on the chart – aside from the tyre data which is not made available by the FIA. The follow description of Q2 provides quite a straightforward reading of the second panel of the chart. In the second session, Rosberg initially set the pace but Hamilton quickly worked his way back to the top of the order, his first run netting a time of 1:32.669. Rosberg was also again eclipsed by Massa who set a time three tenths of a second quicker than Rosberg’s. The last to set an opening time were the Ferraris of Raikkonen and Vettel, though both rapidly staked a claim on a Q3 berth with the Finn in P2 and the German in P4. Most of the front runners opted to rely on their first run to see them through and in the closing stages those in the drop zone were Hulkenberg, Force India team-mate Sergio Perez, Nasr, Sauber team-mate Ericsson and McLaren’s Fernando Alonso. However, the chart does not clearly show how ROS’ early purple time was challenged by BOT, or how MAS early pace time was challenged mid-way through the session by VET and RAI. Hulkenberg was the man to make the big move, claiming ninth place in Q2 with a time of 1:34.613. Behind him Toro Rosso’s Carlos Sainz scraped through in P10, six hundredths of a second clear of 11th-placed Sergio Perez. The Mexican was followed by Nasr and Ericsson. Alonso claimed P14, while 15th place went to the unfortunate Verstappen, who early in the session had reported that he was down on power. Again, this reading of the chart would be aided by an evolving cut-off time line. The first runs in Q3 saw Hamilton in charge again, with the champion setting a time of 1:33.552 on used softs to take P1 three tenths of a second ahead of Red Bull’s Ricciardo, who prior to Hamilton’s lap had claimed the fastest S3 time of the session using new soft tyres. Rosberg, also on used softs, was third, four thousandths of a second down on the Australian’s time. Hulkenberg, with just one new set of softs at his disposal, opted to sit out the first run. In the final runs, Vettel was the first of the likely front-row men across the line and with purple times in S1 and S2, the German set a provisional pole time of 1:32.982. It was a superb lap but Hamilton was already running faster, stealing the S1 purple time from the German. Ahead of the champion on track, Rosberg had similarly taken the best S2 time but he could not find more pace and when he crossed the line he slotted into third, four hundredths [??] of a second behind Vettel. So what does Justin Hynes’ qualifying session commentary tell us about how we might be able to read the charted summary of the session? And how can we improve the chart to help draw out some of the stories? A couple of things jump out for me – firstly, the evolving purple and green times can be confusing, and are perhaps better placed (for a summary reading of the session) by best in session purple/green times; secondly, the evolution of the cut-off times would help to work out where drivers were placed at different stages of qualifying and what they still had to do – or whether a best-time-so-far recorded by a driver earlier in the session was bumped by the cutoff evolution. Note that the purple time evolution is identified implicitly by the lower envelope of the laptimes in each session. One of the things I tend to avoid doing in R, partly because there are better tools elsewhere, is screenscraping. With the release of the new rvest package, I thought I’d have a go at what amounts to one of the simplest webscraping activites – grabbing HTML tables out of webpages. The tables I had in my sights (when I can actually find them…) are the tables that appear on the newly designed FIA website that describe a range of timing results for F1 qualifying and races [quali example, race example]. Inspecting an example target web page, whilst a menu allows you to select several different results tables, a quick look at the underlying HTML source code reveals that all the tables relevant to the session (that is, a particular race, or complete qualifying session) are described within a single page. #would the dataframe cast handle the NA? Depending on the table grabbed, we may then need to tidy it up. I hacked together a few sketch functions that tidy up (and remap) column names, convert “natural times” in minutes and seconds to seconds equivalent, and in the case of the race pits data, separate out two tables that get merged into one. PS In passing, I note the release of the readxl Excel reading library (no external-to-R dependencies, compatible with various flavours of Excel spreadsheet). PPS Looking at the above screenshot, it strikes me that if we look at the time of day of and the duration, we can tell if there is a track position (at least) change in the pits… So for example, ROS goes in at 15:11:11 with a 33.689 stop and RIC goes in at 15:11:13 with a 26.714. So ROS enters the pits ahead of RIC and leaves after him? 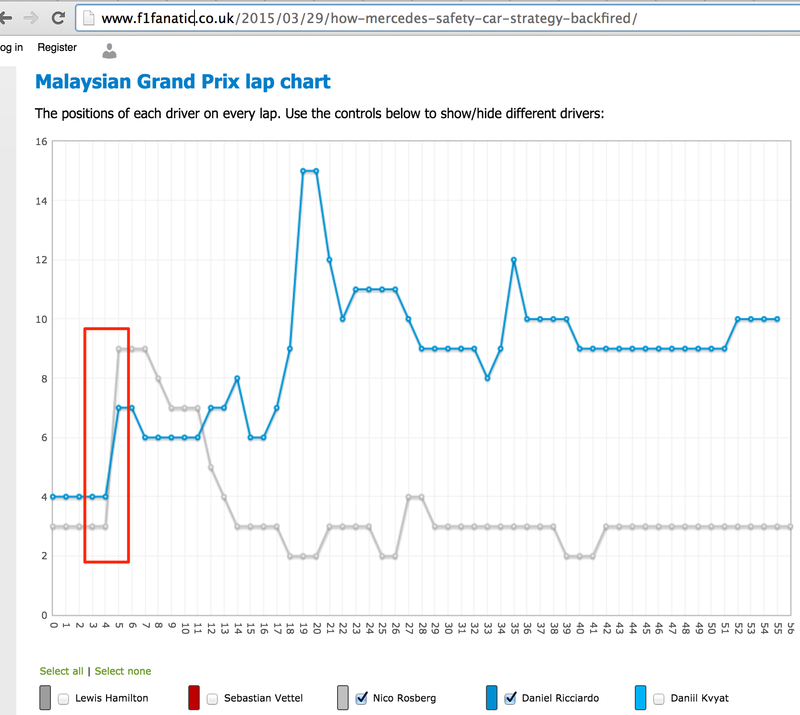 The following lap chart from f1fanatic perhaps reinforces this view?